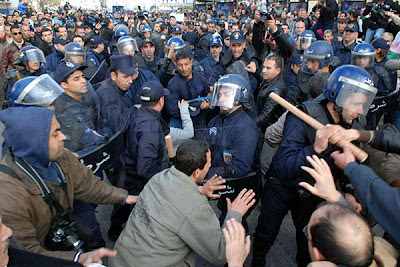 Algerian riot Police scuffle with protesters in Algiers, Algeria, Saturday. Thousands defied a government ban on demonstrations,but were outnumbered by police. Photo by Sidali Djarboub / AP. Last month, the world was shocked as the Tunisian autocrat Zine el-Abidine Ben Ali, who had ruled his country for 23 years, was overthrown in a protest movement that lasted only 29 days. The event was soon dubbed the “Jasmine Revolution,” a symbolic reference to a blooming flower. While many doubted that this revolution would spread, it was only days later that massive protests rocked Cairo, resulting in the resignation of Egyptian President Hosni Mubarak, who had been in power for more than 30 years. While the fate of both countries is still unresolved, one thing is clear: the people are demanding democracy, and they have forced massive changes in their government to get it. ALGERIA: Algeria has been in the iron grip of a military government since 1991, when the regime canceled elections after an Islamist party won the first round. This set off a bloody civil war in the country, which peaked in violence between 1993 and 1997. In recent days, Algerians, inspired by their Tunisian and Egyptian neighbors, have organized large protest marches demanding democratic reforms. BAHRAIN: Bahrain’s Sunni leader, King Hamad bin Isa al-Khalifa, has long oppressed his country’s Shi’a-majority population. Last August, his ruling party arrested hundreds of Shi’a activists and shut down the main opposition party’s websites right before the parliamentary election, fearing that it may lose its grip on power. Yet recent events in the Middle East have the king fearing for his rule, too. He has ordered “a hike in food subsidies and reinstated welfare support for low-income families to compensate for inflation,” and was to deliver a speech Sunday where he was expected to offer further concessions. Additionally, Bahrain’s government announced that it will be giving $2,650 to each Bahraini family. Yet pro-democracy activists planned to march Monday anyway, demanding real reforms in the country. JORDAN: Likely also fearing a Tunisian-style revolution, Jordan’s King Abdullah sacked his government and appointed a new Prime Minister at the beginning of this month. Yet some of the largest protests in modern history have rocked the nation in recent weeks, indicating that Jordanians do not see the concessions as enough. In perhaps a sign of the regime’s weakness, President Obama dispatched Adm. Mike Mullen, the head of Joint Chiefs of Staff, to meet with Abdullah this weekend. SYRIA: Earlier this month, protesters planned a “day of rage” where they would protest their grievances against the unelected president Basher al-Assad. While the protesters ended up being few in number, the regime did deploy its security services in increased numbers across the country, visibly fearful of a protest movement like the ones in Egypt and Tunisia. The government also lifted a five-year ban on Facebook, in a move widely seen as appeasing a nascent protest movement. YEMEN: The president of Yemen, “one of America’s foremost allies” in the region, promised to step down in 2013, as his people began to demonstrate against the ruling elite. Saturday, thousands of pro-regime demonstrators attacked anti-government demonstrators with clubs and knives, an eerie parallel to an Egyptian tactic that failed to quell protests and destroyed the regime’s public reputation and international support. This list is far from comprehensive, as movements are being organized in a number of other countries such as Saudi Arabia and Oman. Whether these movements will ultimately be successful is unknown, but they symbolize a growing grassroots call for democracy that has been virtually unseen in the region. Given that the United States is a sponsor of many of the intelligence and military apparatuses of these countries and a close ally to their governments, we have not just an opportunity but a responsibility to work with the people towards a more democratic future. 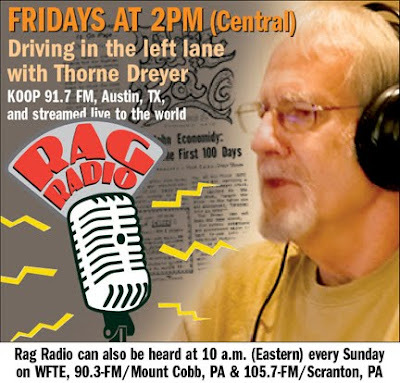 Joan Wile : Calling All Grannies!